Ready to buy new carpeting for your home? Before you head out and start narrowing down your choices, it’s a good idea to know approximately how much carpeting you’ll need. Carpeting comes in a variety of sizes and widths; knowing your room sizes ahead of time can be a big help in making the right decisions. Though nothing will take the place of having a professional installer make the final measurements, start with a few measurements yourself. Step One: Draw a diagram of your home. Include all the rooms that will be carpeted in the process. It doesn’t have to be completely to scale, or even look like it was created by a professional architect. Its simply a guide to help you measure and keep notes. Using graph paper can sometimes help you in your process, or use a simple computer program to help you add in the details. Once you have your rooms in place, its time to pull out your measuring tape and start measuring. Round each measurement to the nearest ½ foot mark, so a room that is 14 feet 3 inches would be rounded to 15 feet 6 inches, or 15.5 feet. This little bit of extra carpet will make sure you have enough. Mark each measurement on your diagram in the appropriate room, and add in notes if you have questions. Rooms should always have two measurements, length and width, and should end up with a final measurement something like this: 15.5 x 14. Once you have measured all rooms, make a list of each of the measurements. Multiply each room’s length by its width to come up with the total square feet of carpeting needed for that room. Add up the final measurements for every room you will be carpeting to determine total amount of carpeting needed for the job. Don’t forget to add in hallways, closets, and other areas that may be hidden or forgotten during the process. When professional carpet installers work on a project, they may need additional carpet for seam allowances and for other needs of the job. Its always important to add in a little extra for safety sake. A good rule of thumb is to add in 5 percent extra to make sure you have enough for the entire job. Take the final number you calculated in step three, and add in 5 percent. This will provide you with the total square feet needed for the job. Most carpeting is sold by the square yard. To calculate square yards from your final square footage total, simply divide your total number by 9. 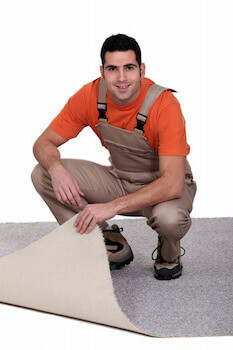 That’s it – this gives you a good estimate of how much carpeting you will need to complete your project.